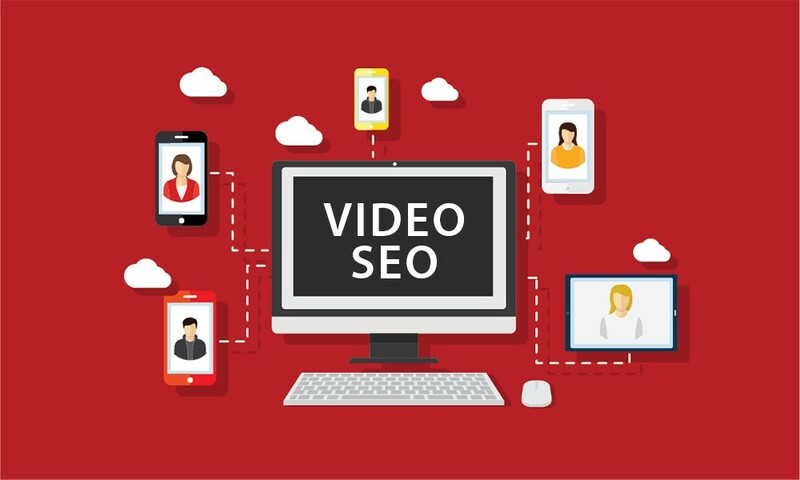 Given that the use of video in online marketing is on an upward trajectory, it is obvious that marketers who are using the best video SEO tactics enjoy an edge over others. SEO for video requires a specific set of skills and a clear understanding of the science behind it. In this blog, I will discuss 5 effective tips and tricks for optimizing your videos for better SEO results. Whether you are hosting the video through YouTube, Vimeo or using a video hosting platform like Wistia, the title of the video determines the clicks you get or how frequent your video will show up on suggestions. 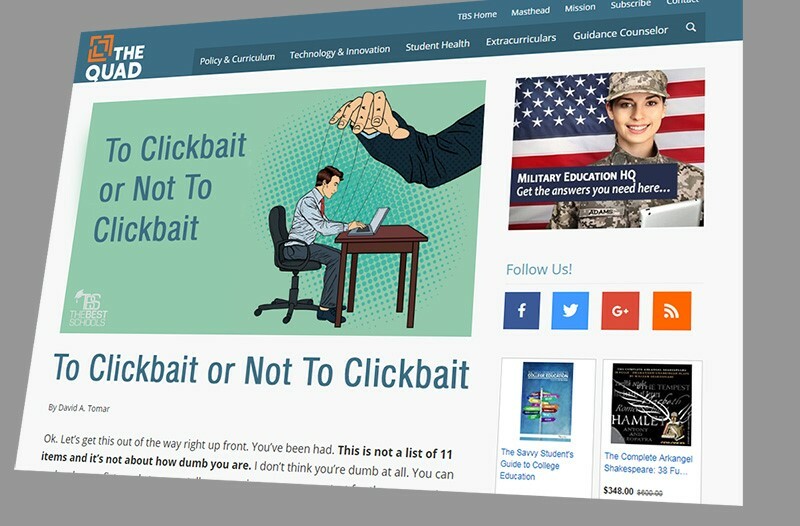 Beware of using clickbait for video SEO, because though they create an instant first impression, users may steer clear of your channel altogether. If your video title is clickbait that does not follow up with the content of the video, then you are in trouble. From viewers lashing out in the comments section to the lack of interesting content, a lot can go wrong if your title is misleading. Alternatively, composing the video title with effective keywords that align with the video content you are uploading segregates the audience and welcomes potential viewers. 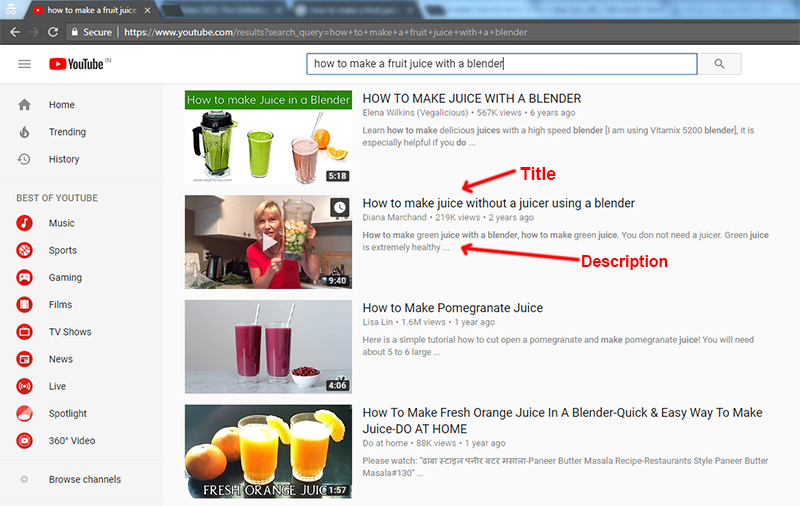 You should be aware that keywords that rank well on Google Search might not work as well on YouTube. Let YouTube predict the rest of your video keywords with its frequently-searched-keyword suggestions. Just hit the search box on YouTube and start typing your keyword. You will see a drop-down with the most related search keywords on YouTube. If you would like to go deeper into the keyword research, you might want to use some competitor keyword analysis tools to find and filter out the keywords that are too competitive. Do not underestimate the description part though. In the search results, YouTube will display the first 125 characters of your description. The description of a video helps the bots understand more clearly what your video is about. It also gives your viewers an additional line to read before they actually click on your video from the search results. Not to mention, your description should be attention-grabbing because it’s the next most visible opportunity for you to entice your audience into clicking your video. You should also consider using relevant keywords within the description. 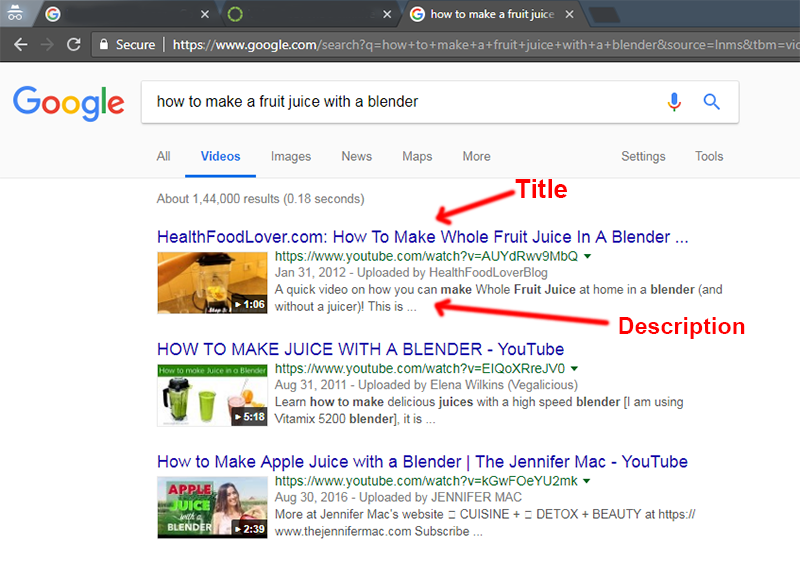 Below are two screenshots for how your description and title shows up on Google video search and YouTube search respectively. Clickbait as thumbnails could drastically affect your video’s views. YouTubers popping their eyes out with quirky letters floating around and the occasional emoticons are some of the more popular attention grabbing tools. Viewers love originality and a personal touch; hence, instead of googling a tutorial photo, prepare something of your own. This could be your own face on the thumbnail, the animated characters in the video or an amalgamation of both. There are several free tools available online which lets you create an attractive YouTube video thumbnail. My personal favorite is Fotojet. You can easily add your own images and add text above it or you can choose from their templates. Ideally, it is always better to have some text on the thumbnail which further enhances the CTR or click-through-rate. Again, make sure that the thumbnail is strictly content related that gives viewers the gist of your video. 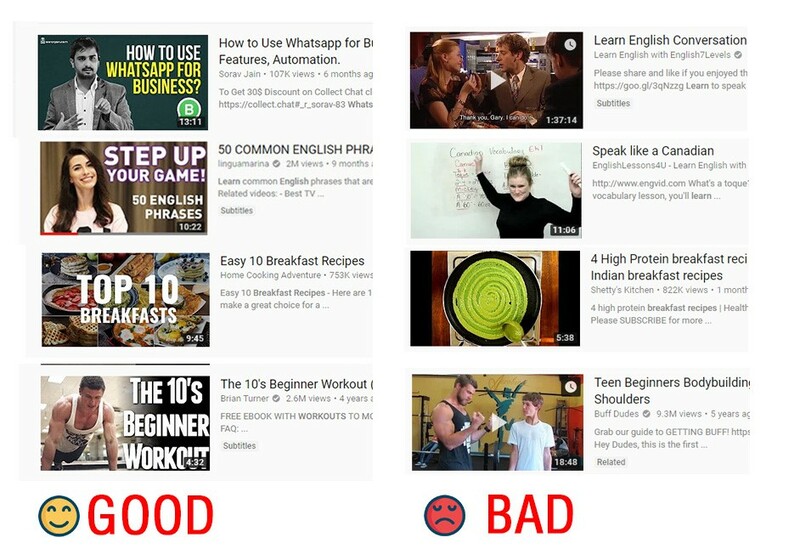 Below are examples of some great YouTube video thumbnails versus some not so great thumbnails. Well, I guess you’ve made an awesome video that really captures the attention of your audience and gets the message across. However, a video placed in the wrong position on your landing page will be unfortunate. A website that promises an educational video, yet makes you scroll all the way down to finally discover it is a pity. Several website owners commit this rookie mistake. The labor of having to scroll down to the bottom of the page is strenuous in the world of the Internet, which could result in a loss of audience engagement. If your video is embedded or hidden on the page, then the chances of viewers finding it are pretty low. Place your videos in a way that looks relevant to the entire page. It could be either at the top of a blog or in the middle when the video reference has come up. People often shut off Facebook or Twitter videos after a second or two mainly because of the sound. Your audience likes its privacy; give them the option of watching the video in mute mode with the help of a video transcript or subtitles. The soundtrack of your video works when people are watching YouTube and settling in for the experience. However, social media videos are more sudden, which is why video transcripts are pivotal. 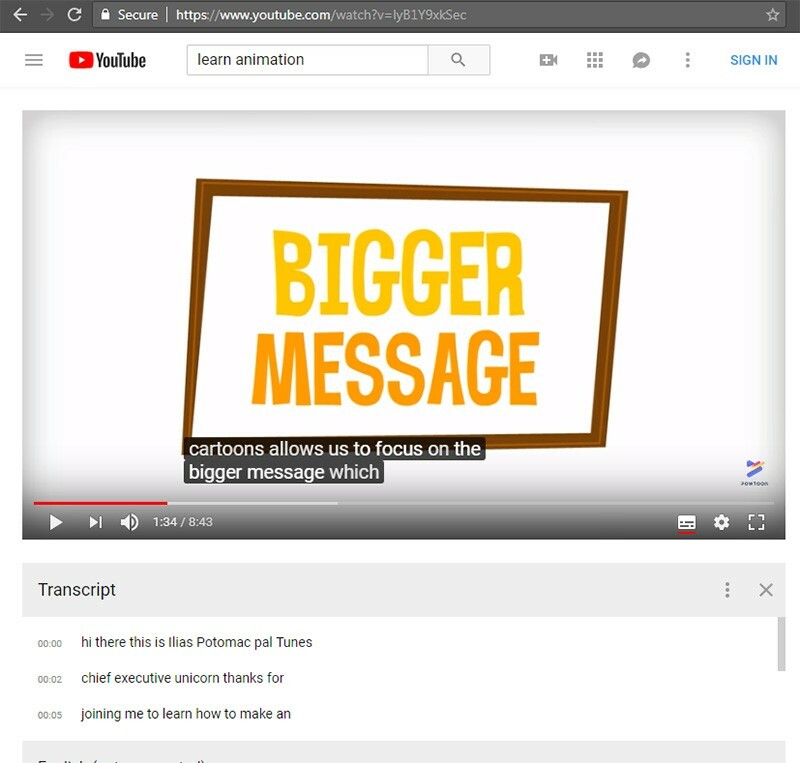 Often times YouTube’s automatic closed-captioning or “CC” generation is faulty due to problems with pronunciation. Non-native speakers may find it difficult to follow the language. Always have a transcript prepared. A boring informational video with a person addressing their audience for a few minutes will eventually tire the viewers. The monotony of having to stare at the same picture of a person detailing the outcomes of another disengaging subject is unbearable on the Internet. 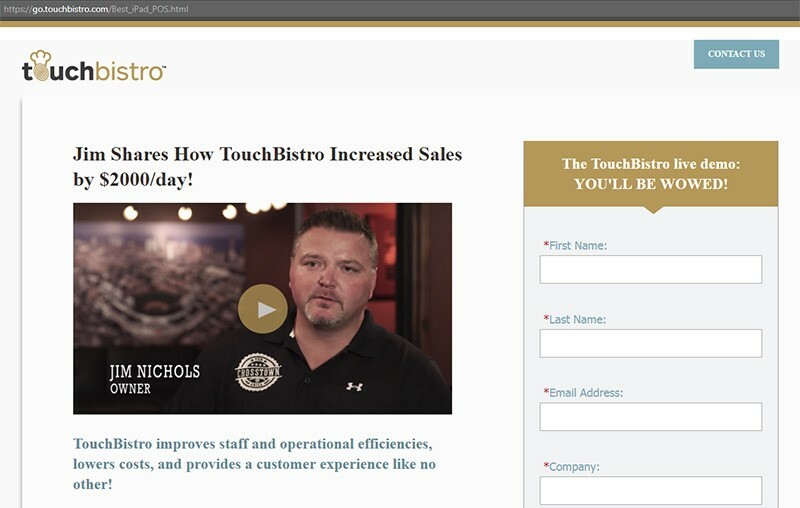 Engage the audience with quizzes, personality tests, surveys and occasional in-video links to give them closure and make them feel connected to your channel, website or page. Making the use of story-based animated videos or explainer videos are also good options. Despite the Internet preaching unrealistic goals, audiences have a natural desire to appreciate authentic and relevant contents. If you have any video SEO tips or tricks up your sleeve, feel free to share it with us. We would love to hear from you. Moloy is the founder and CEO of PixelGenio, a leading explainer video production company based in India and the US. He is also a passionate blogger and a video marketing enthusiast. When he is not working with his video team or busy with blogging, he likes to pursue his love for heavy bikes.